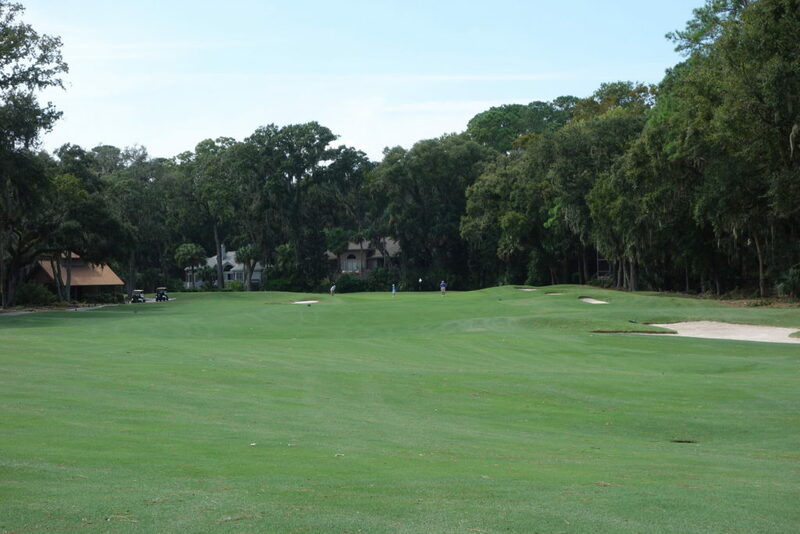 When I made my first trip to Sea Pines on Hilton Head Island back in 2012 to play Harbour Town Golf Links, the place felt a little tired and old. If you were to return today, you might not recognize the new facilities. 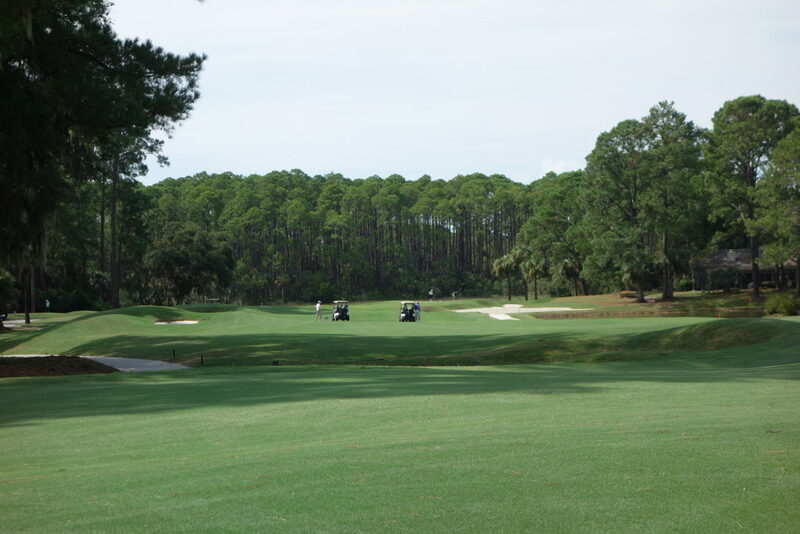 Bill Goodwin, a developer and the owner of Sea Pines, has poured tens of millions into a revamp of the resort, which he purchased in 2005. One of the beneficiaries of the new capital investment was the Heron Point Golf Course and clubhouse. 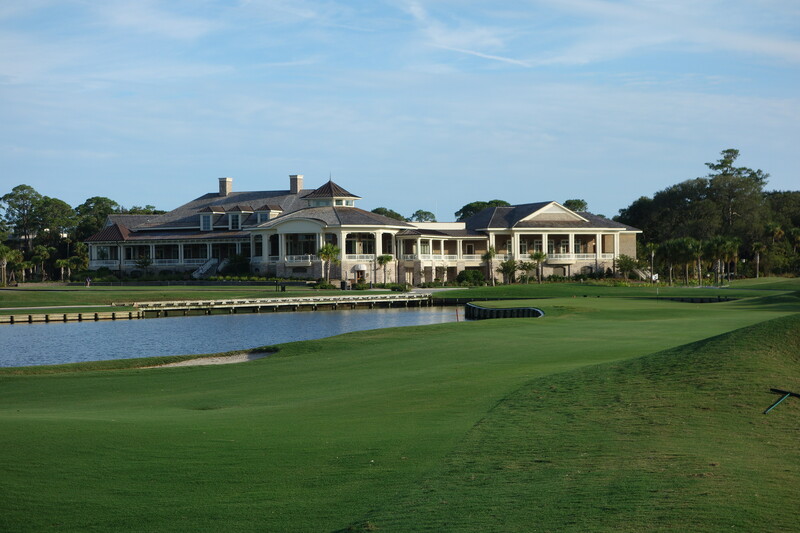 Heron Point (formerly known as Sea Marsh) received a Pete Dye redesign in 2007, and a massive new practice facility was built behind the clubhouse. Additionally, $15 million was invested to replace the Plantation Club, which is the clubhouse overlooking Heron Point and the soon-to-open Atlantic Dunes course. 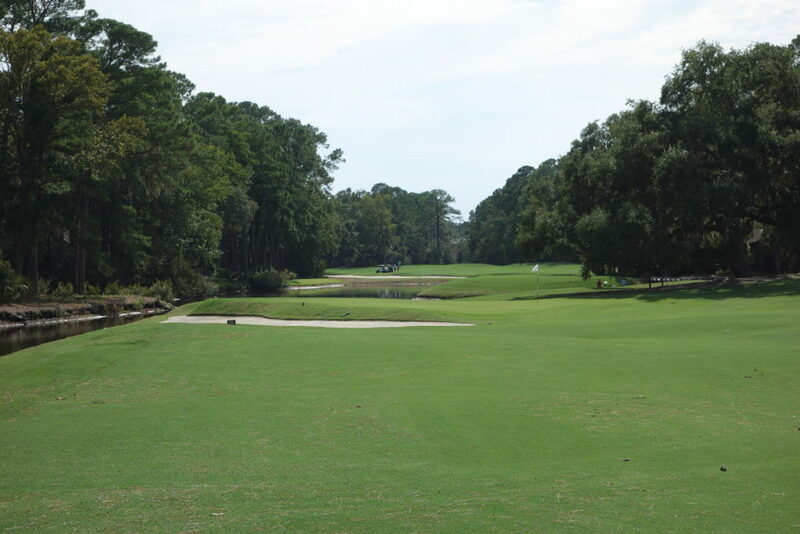 In all, it is estimated that Goodwin has invested over $50 million into Sea Pines and the resort now feels fresh and competitive against rivals like Kiawah Island Golf Resort, which happens to also be owned by Goodwin. 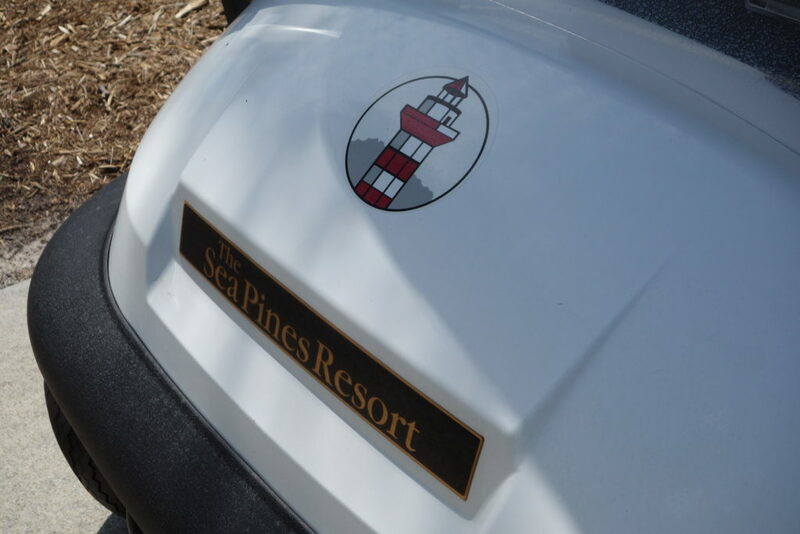 By the end of 2016, every course and every clubhouse in Sea Pines will have been renovated or rebuilt. Talk about some epic projects. 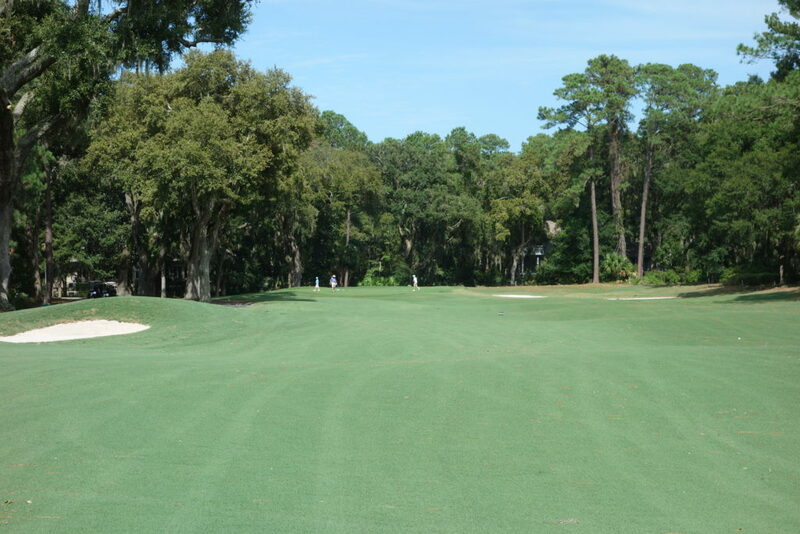 Although I never played Heron Point prior to Dye’s redesign in 2007, I have been told the redesign is a vast improvement. I got to play the course for myself this past Labor Day weekend, and despite a tropical storm passing through the day prior to our round, the grounds crew had the course looking great. On a side note, I typically try to keep carts and the group ahead out of my photos in reviews. The course was so busy during our day of play that it was unavoidable. I can’t blame everyone for wanting to play after a few days of rain on Labor Day weekend! 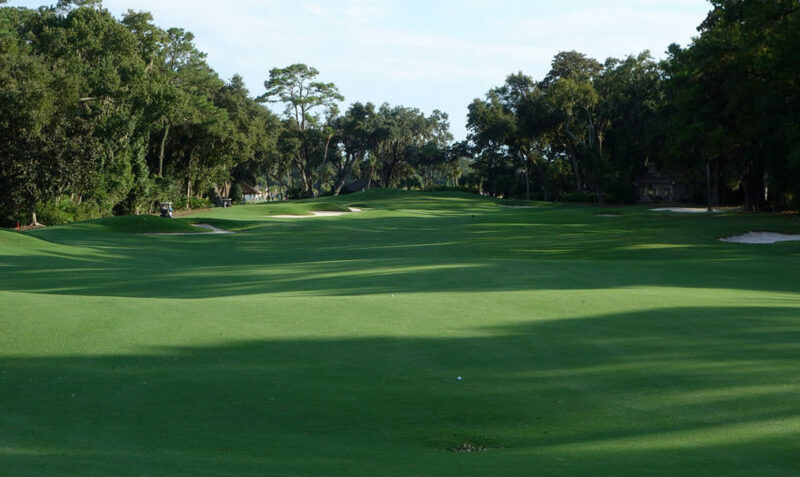 Hole #1 – 376 yards – Trees short and left of this green mean the best approach angle is from the right side of the fairway, close to the bunker and water. Great strategic design! 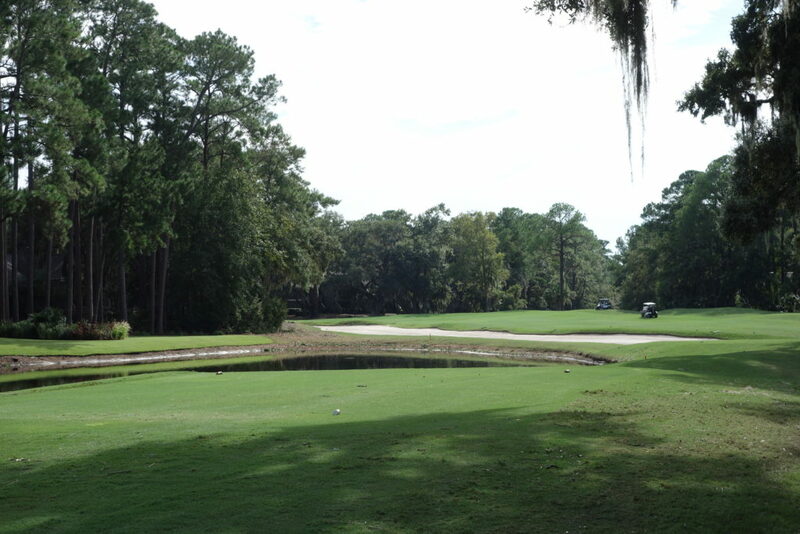 Hole #5 – 380 yards – I mistakenly assumed that the pin straight through the end of the fairway is the 5th green… I was wrong. 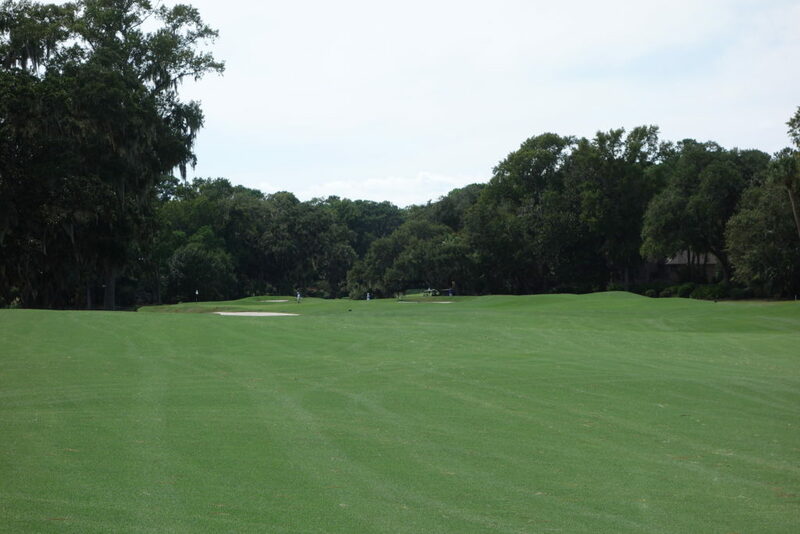 The hole is a sharp dogleg right, but the best line off the tee is indeed the flag through the fairway. 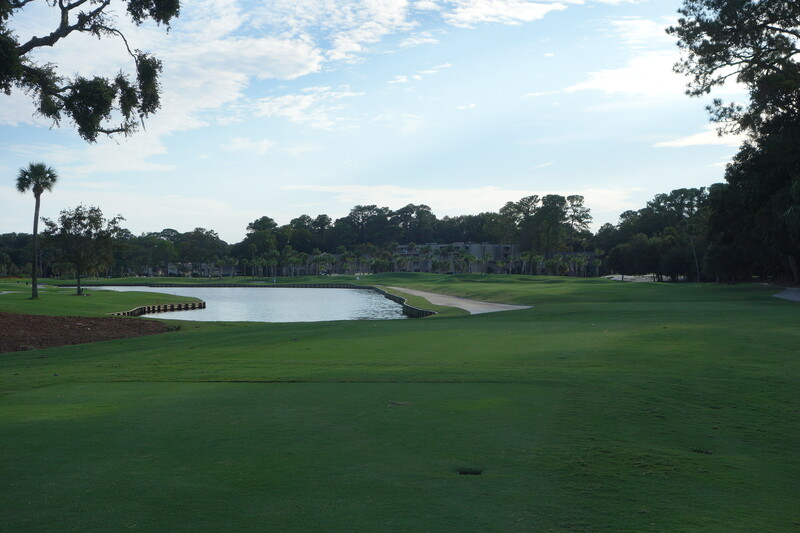 Hole #6 – 539 yards – Bigger hitters can reach this green, but the lake on the left is a deterrent. 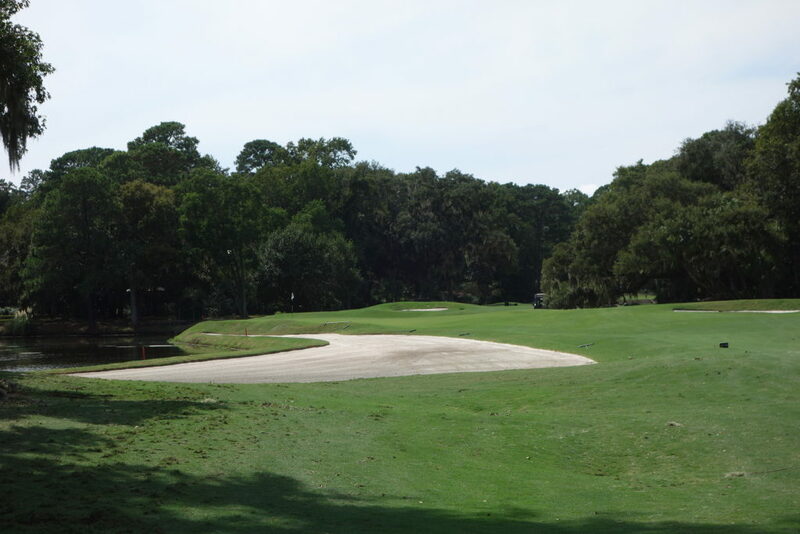 Hole #7 – 164 yards – Note the Dye railroad tie bunker lip, which is a feature also found on his Harbour Town design down the road. Beautiful hole! 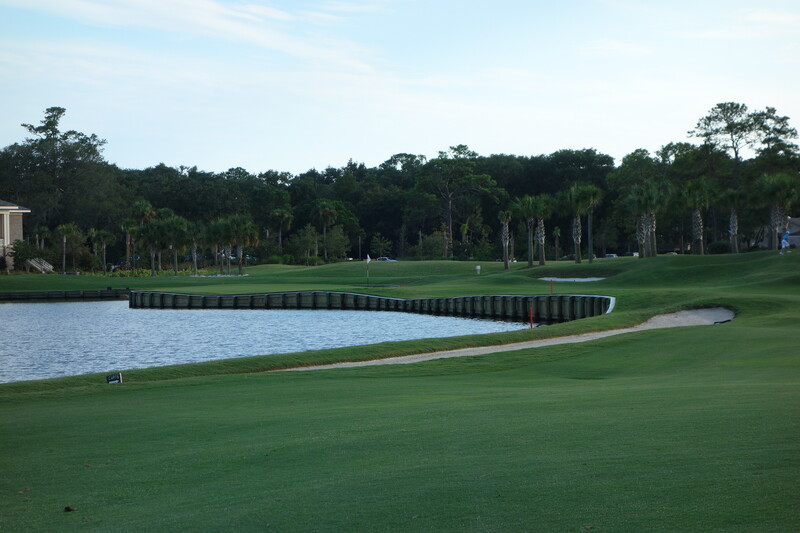 Hole #8 – 412 yards – This is the number one handicap hole on the course. Long hitters can attempt to cut the corner off the tee, but most players are forced to hit an accurate mid-iron into the green. 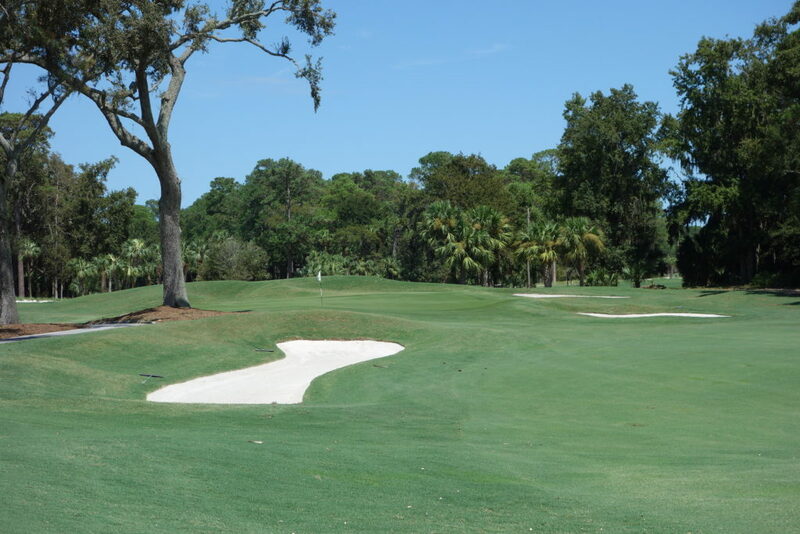 Hole #10 – 348 yards – Hitting the fairway is crucial here and a bunker short of the green obscures the view, adding difficulty. 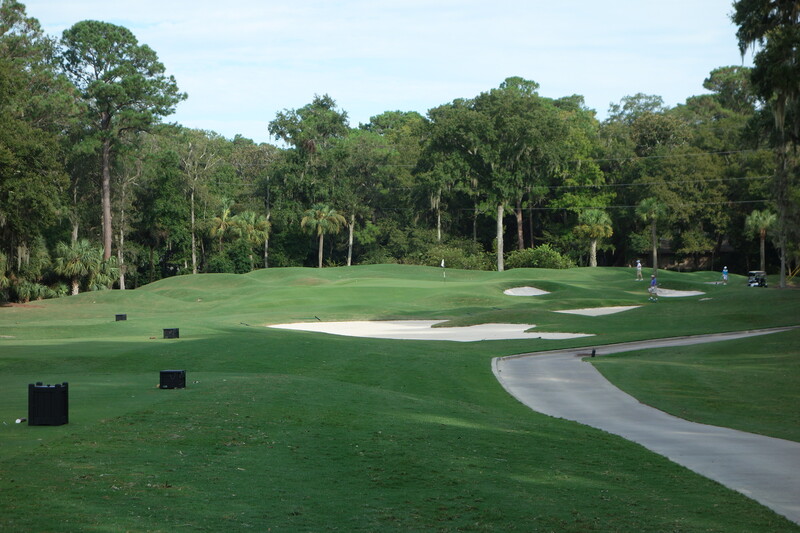 Hole #11 – 550 yards – Avoid the cross bunker on this dogleg left and the lay up to the cart in the second photo below. 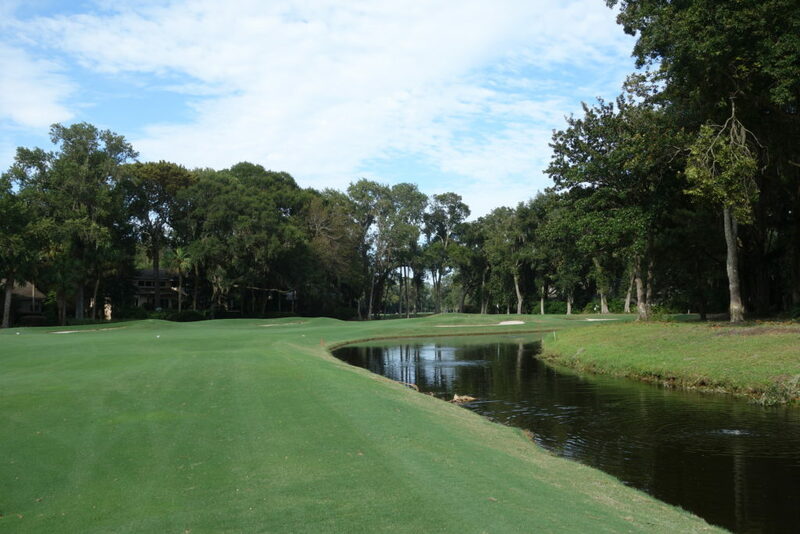 Hole #13 – 141 yards – That darn lake creeps in a little closer than expected on the left! Aim center green and avoid the water at all costs. Hole #14 – 350 yards – I really enjoyed this hole. 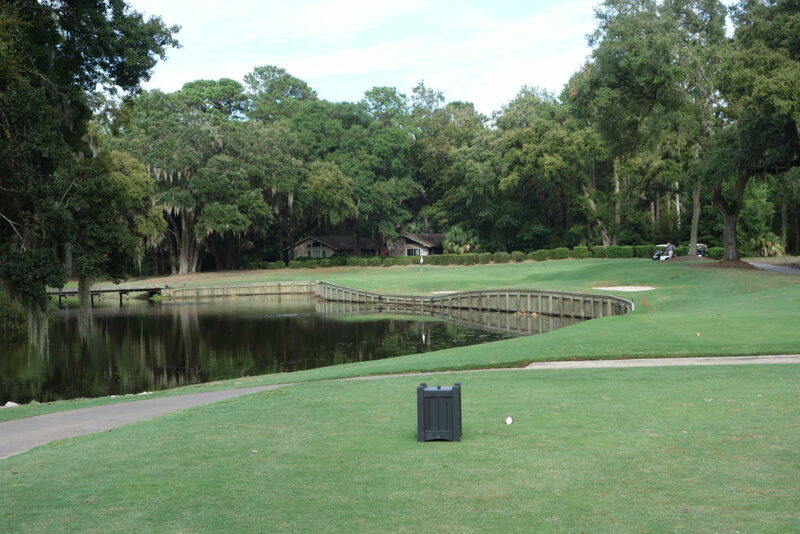 A waste bunker runs up the right side of the fairway and spills into a lake at 220 yards from the tee. The lake then runs all the way to the green. 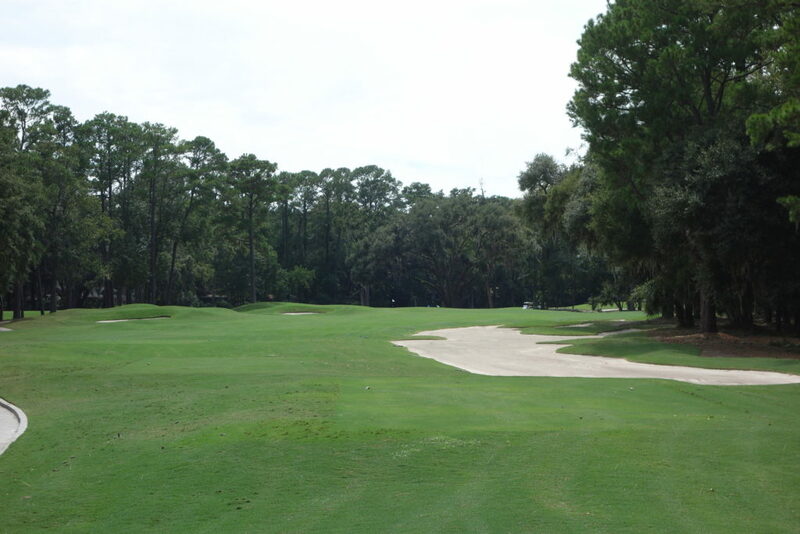 Hole #16 – 196 yards – This is a beautiful green complex with a larger putting surface than appears from the tee. It takes a well struck long iron to reach and have a birdie putt. 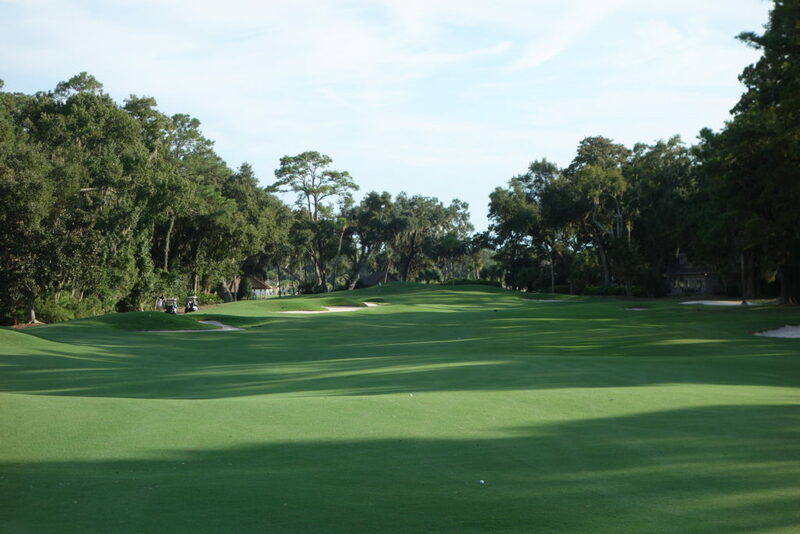 Hole #17 – 487 yards – This is another dogleg left par 5, but the approach to this green is particularly good. The green works back and left from the fairway, with a front left bunker that protects the pin. 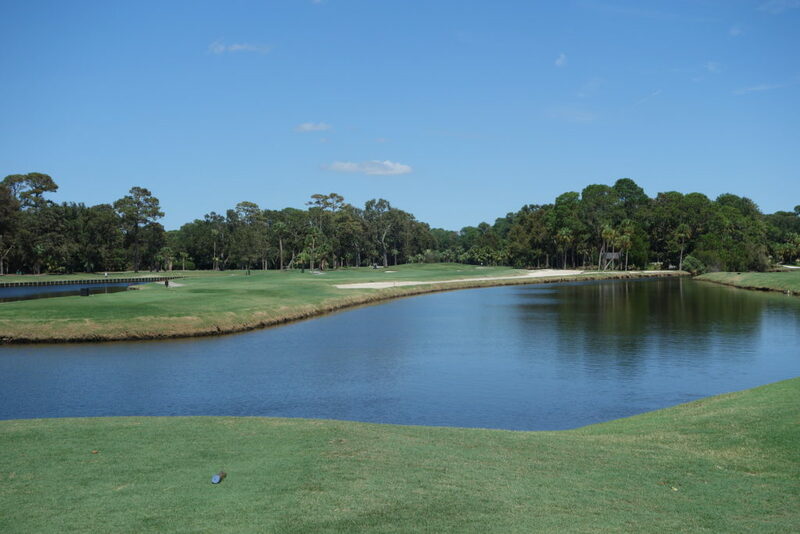 Hole #18 – 377 yards – The 18th is reminiscent of Dye’s 18th at TPC Sawgrass, but the bunker right of the water acts as a nice buffer for pulled tee balls. 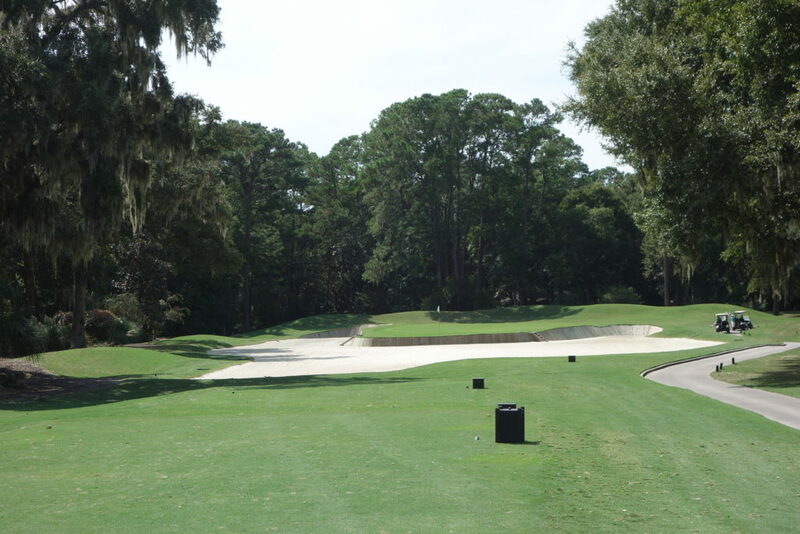 Longer shots down the right bring bunkers into play, but also provide the best angle into the green. 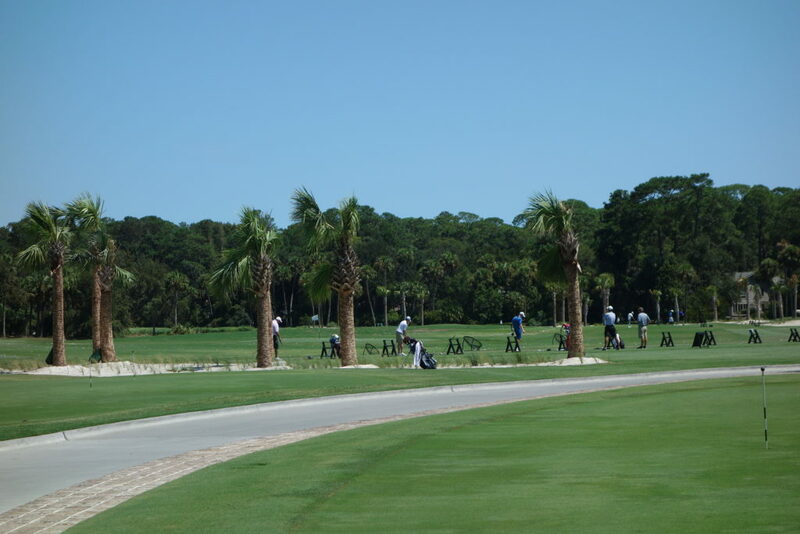 The amount of work and investment that has gone into Sea Pines is staggering, and the experience at Heron Point is great because of it. 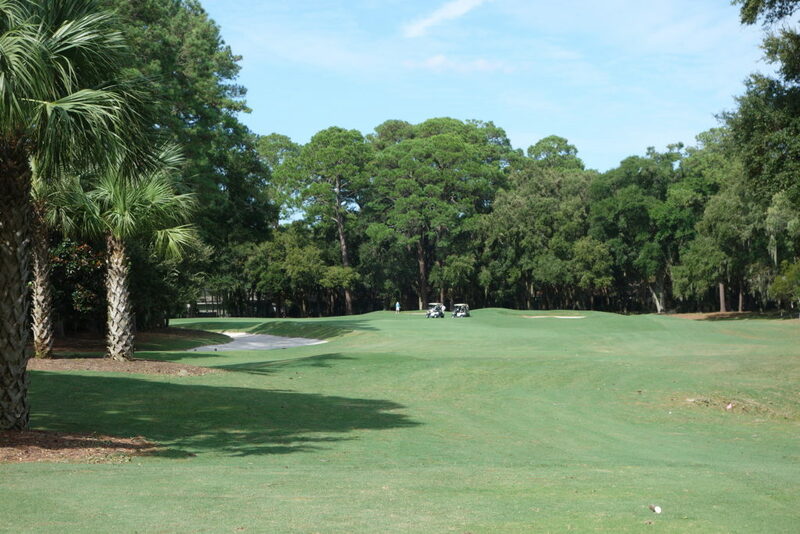 If I came down to Hilton Head on vacation and spent the money to play Heron Point, I wouldn’t be disappointed. 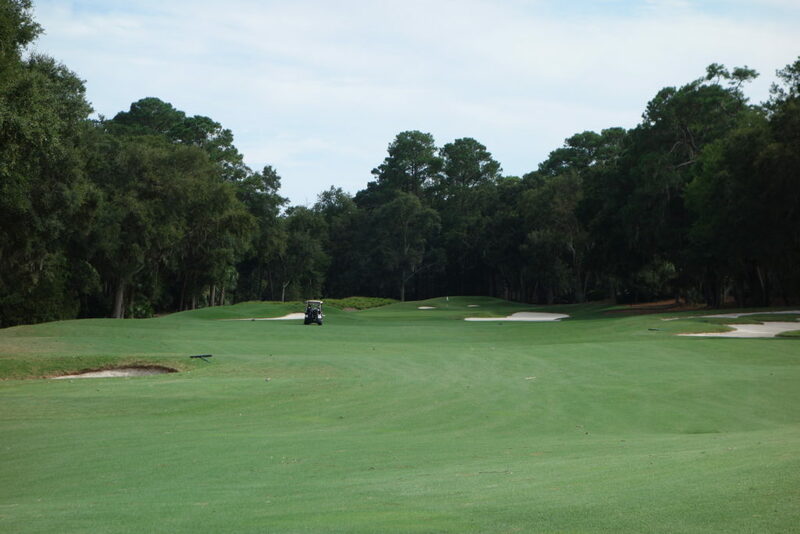 The huge range, short game area, and stunning clubhouse complement the course well. I’d like to play it again.